Apart from Blockchain Academy's main objective, which is to serve the working class and professionals with their training needs, we have added another bold mission : to teach 100,000 children about Blockchain technology and expose them to Fintech. Reason #1 - Blockchain technology has been touted as one of the century's most disruptive technologies. According to a coindesk report, blockchain startups have raised nearly $3.9 billion through VC (Venture Capital) funding in 2018. 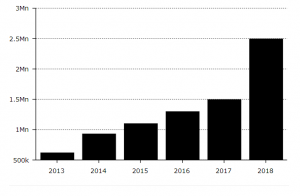 And if you look at the chart, you'll see the number of VC investments have been rising. What this means is, there is a bright future for children to start learning about Blockchain and Fintech at a very early age (as early as upper primary and secondary) so that they are ready and able to snap up the high-paying jobs in the near future. Reason #2 - The other reason is data privacy and security which is right now a major concern of the world. Fact is, existing centralized systems can easily be manipulated and tempered with. With the advent of Blockchain DApps (Decentralized Applications), there is going to be a huge demand from the private, government and even banks to create data privacy and security type applications. Our children need to know about this and be prepared to take advantage when this goes mainstream. Because in order to fully appreciate Blockchain's technology, one will be required to learn coding. According to the author of TeachYourKidsCode.com, he says "understanding computers and learning the basics of coding helps children develop an appreciation of how things work." He also said, "the ability to solve problems is a trait that is useful in life in general. We all want our children to become excellent problem solvers so that they can overcome any adversity they face. Learning to code gives children the chance to learn this type of skill while they are young and it can help them along the way in life." How much can a blockchain developer earn in a year? According to PwC FinTech director Jeremy Drane, the number one issue facing the blockchain industry today is a lack of talent. “An experienced blockchain developer can command $220,000 a year”, said Jered Kenna, an entrepreneur. 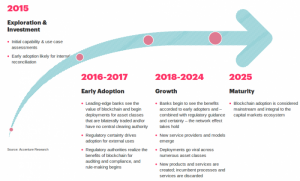 Image from Mc Kinsey Co.
And if you take a look at a recent McKinsey Co. report, evidence is showing that the rollout of Blockhchain technology will occur in 4-stages. We are right now in the Growth stage. It will take another 6-7 years before the technology is considered matured. We need to introduce Blockchain in schools. We want to conduct weekly classes either in their schools as part of extra curricular activity or in our academy office itself. But we can't do this without your support. We need to get in the door of headmasters of government and private schools. We need to reach out to the parents via parent teacher associations and more importantly we need funds! Not much but enough to start hiring additional hands for this. It's a bold mission, but we are confident, we can make this happen, together. Let us be part for a greater cause of good. Want to support us? We thank you in advance. Simply fill up the form below or call us during office hours (Mon-Fri) @ +603 2276 0068. Tell us how you want to contribute. How you can contribute in our mission?